Macworld Expo is only a bit more than month away, and we are expecting surprises. 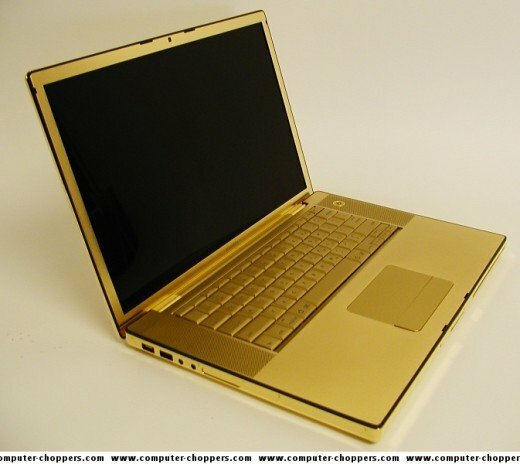 We heard that CNBC is reporting about Apple plans at Macworld to introduce a 12-inch Mac laptop with flash memory in place of a hard drive. There are suggestions that the ultraportable Mac is 50 percent thinner and lighter than a current MacBook Pro, the largest notebook in Apple’s lineup. The pricing is expected to be at $1,500, the same price as the 13.3-inch black MacBook. Also, we can expect 3G version of the iPhone. Let us wait a bit. Looking for a company to your golden Zune 2 or iPod shuffle and Nintendo DS? 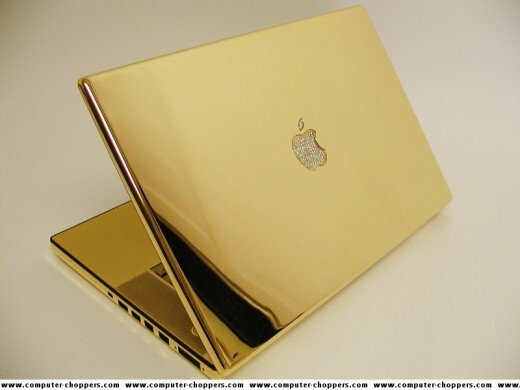 This mod from Computer Choppers includes a full 24-karat gold plating of Macbook Pro case. Not golden fleece, but golden iPod shuffle. iPod Shuffle made from real 18 carat gold for those who has status. Now that’s hot! Also, some diamond embedding or upgrade is available along with 24.7 customer service. Another nudge to iPhone. Time named iPhone the “Invention of the year” for five reasons. When all that is left from the mankind would be a capsule with Google, E.T. would think that iPhone is a term for all phones. Like that Xerox thing. Real diamonds on your iPhones. Oh, and by the way, here is a sweet company to our luxury pack. These are iPhones, encrusted with hundreds of diamonds. The creator of this mod, Amosu, is known for loading up mobile phones with precious gems and metals. This precious iPhone has 420 diamonds (5.65 carats), and can be set in 18-karat white or yellow gold. This iPhone — over $40,000. Reading Gadgetsmonkey.com — priceless. Macbooks upgraded to bring more joy and happines to this world. The Apple MacBook is finally on Santa Rosa architecture with a GMA X3100 video bump from the GMA 950 for significant benefits. And the MacBook Pro can now be configured with an optional 2.6GHz Core 2 Duo for a $250 premium over the previous 2.4GHz flag-ship configuration. Sony steals Apple iPod ad. Yesterday we wrote about new Sony camera DSC-T2 with 4 gb Flash memory onboard. And today I’ve found this. This picture of 2-nd generation Nanos is dated September 12-th, 2006 while those glossy Sony’s digital cameras are freshly baked. Whether Sony’s designers and art directors are Apple fanboys or it’s just a custom and usual industry steal, Sony should change it’s motto to like.no.other.except.some. Bowers & Wilkins Zeppelin Ipod Speakers show real class. Bowers & Wilkins have released their uniquely designed Zeppelin Ipod Speakers. The speakers also allow streaming video from an iPod to a television and have a remote. And for sure well-defined bass and clear sound. The Bowers & Wilkins Zeppelin iPod Speakers are available in all stores with Bowers & Wilkins products. New iPod nano 3rd generation meets the new tilted screen problem. According to some gathered data from forums with customer reviews and other technoblogs, seems like the new iPod nanos meet some screen problems that can be serious. The Big Fight. Ipod vs. Zune complete compare. As new Zunes disappointing battery data is official now, we can relax, take our time and compare these two creations from Apple and Microsoft. Zune 80 quite compares with Ipod 80GB Classic, though it’s battery resourses seem to be weaker, but what about Ipod touch? What’s more important — gigabytes or sweet multitouch screen and the bigger price? It’s harder to choose between flash Zune and Ipod Nano, it’s up to you — WiFi or 1.8 inch screen? Looking forward to Novemver, we created useful comparative tables for your entartaiment and argues. They are below the link with some more battery data and “premium” Microsoft earphones. Enjoy!